Once we decided to sell our house and become full timers, the search was officially on. So at the beginning of 2013, we decided to pursue the procurement of a new coach before we put our house on the market. There were many reasons for this strategy, but primarily it is one of logistics. A new-to-us (and particularly a brand new) coach would have bugs that need to be worked out and changes we would want to make and that would be a lot more manageable before we (and our furry felines) would be living aboard full time. 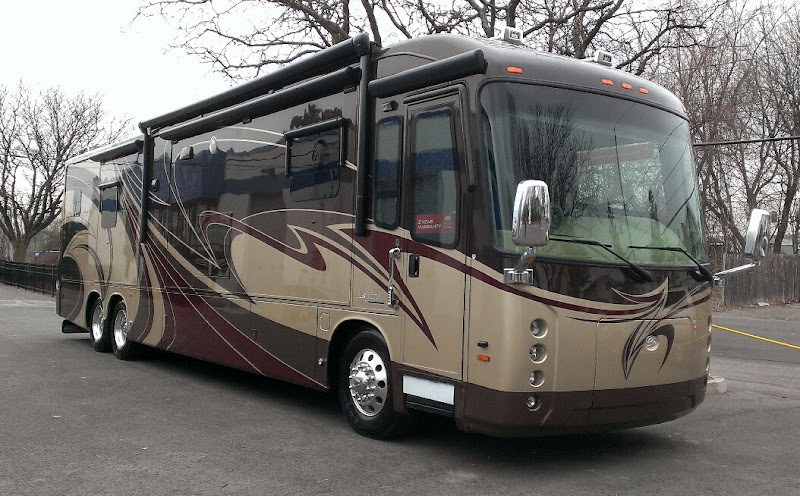 There is always plenty more to learn and we learn new things every day, but by 2013 our knowledge base about the industry and its products had increased exponentially since our first coach in 2010, a 2006 Fleetwood Discovery. And not just based strictly on research, but the actual ownership and day to day living aboard. One word of advice to a first time coach buyer – you can devour all the specs you can find but there are things you will never learn about what works for you until you actually live it for a while. Choose your first coach and consider it a trainer, then live with it and learn what you *really* want after you have some real miles under your chassis. It’s not that we didn’t like our 2006 Fleetwood Discovery, but for full time living it lacked some of the features that we desired. More storage space, especially pass through storage in the basement, a 1-1/2 bath layout and a larger capacity separate washer and dryer (the combo washer/dryer that the Discovery had was great for small loads, but the drying function left a lot to be desired) – to name a few. In addition, like our Discovery, our new coach just had to be a diesel pusher (DP) – once you’ve had a DP it is difficult going back to a gas model. The lack of airbag suspension, opposing slides and large cargo capacity would create a big loss in comfort. And with the engine in the rear the ride is quiet and well balanced. After much deliberation, we also decided to go with a tag axle. Although this feature eats up exterior storage and adds the future expense of two more tires, the ability to support coach lengths in excess of 40′, an increase in cargo capacity, on the road stability and the additional braking capacity makes up for those shortcomings. So with that criteria in mind, the hunt began. During our research we had read about Entegra motorhomes. Entegra is the reincarnation of the quality builder Travel Supreme who got into trouble in 2008 (along with most of the rest of the RV industry) and was purchased by Jayco shortly thereafter. Unfortunately, in the New England area there are only a few RV dealers that sell diesel pushers and most of them had never even heard of Entegra never mind have any in stock for us to look at. In fact at the time (early 2013) no dealers anywhere had unsold Entegras to look at – they were either selling immediately upon delivery or were ordered units. So we ended up taking a trip out to the Entegra (Jayco) factory in Middlebury, IN. Not only did we take a tour of the Entegra factory but we also went to several other assembly plants including Newmar and Thor. On previous trips we had made visits to Fleetwood/American Coach and Tiffin. After much deliberation, weighing the pros and cons of each manufacturer/model, we decided to purchase a 42′ 2013 Entegra Aspire in April of 2013. Entegra offers three motor home models – the Aspire, Anthem and Cornerstone. For a detailed description of all the features of the Aspire, click here. 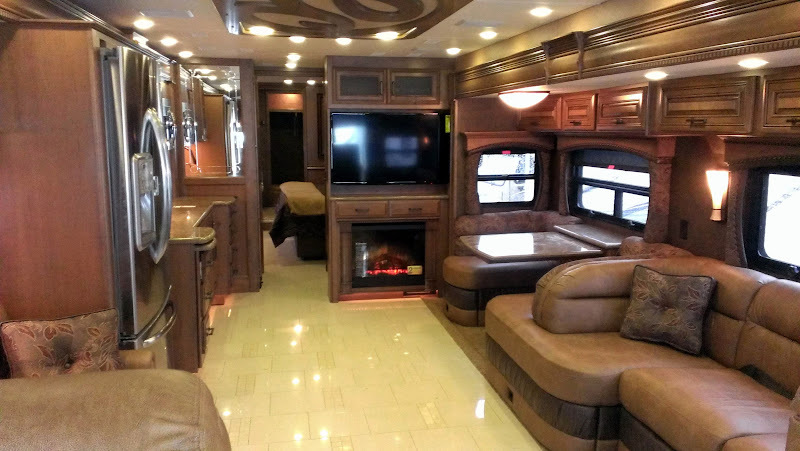 Our particular model is the RBQ which has a large rear bathroom and a half bath in the middle of the coach. The electric fireplace is one feature that was not on our wish list but came with the coach and turned out to be an uber useful addition. Great for taking off the chill on those cool evenings! Saves money too in that we don’t have to use our propane heat very much, the fireplace keeps us toasty well down into outside temps in the 30’s. Some may scoff at the “fake” ambiance of the fireplace (we did initially) but the heater is powerful and very real. Also the fake flame goes quite nicely with our fake candles (lighting fixtures). Like anything new, we’ve had to work out some of the kinks and bugs during our first year and have been busy making modifications (our favorite being the addition of a dishwasher). But overall we love our Entegra and we love full timing!